It’s not unfair to say that the Kia K900 hasn’t exactly lit the automotive world on fire since it debuted in 2015. In fact, I don’t blame you if you weren’t even aware that Kia made it in the first place. For those unfamiliar or wanting a refresher, the K900 is Kia’s full-size rear wheel drive luxury sedan, based on the underpinnings of the first-generation Hyundai Genesis sedan. When it was launched in 2015 it only came with one powertrain: Hyundai’s 5.0L ‘Tau’ V8 with 4 cams, 32 valves, direct injection, and 420 horsepower. Since then they’ve added a 3.8L V6 with 311 horsepower as a base model, and that’s fine, but it’s not what we are here to discuss today. 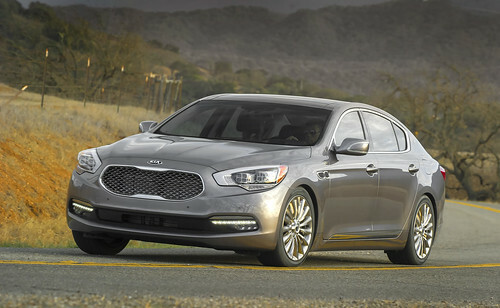 I, like many others, scoffed at the concept of the K900 when it first debuted. Mainly the price: with a starting MSRP of $59,900 in 2015, it suffered from Volkswagen Phaeton syndrome. “Do they honestly expect people to pay,” they ruminated, clutching the keys to their $63,500 BMW 530i M Sport Executive with its whistling 2.0L four cylinder engine, “60 THOUSAND DOLLARS for a Kia? Aren’t they made in communist North Korea?” Much in the same way that the Phaeton was ignored for its price and its badge rather than the merits of its substance, 60 grand for a Kia was a hard pill to swallow. And truth be told, the naysayers weren’t wrong. Kia hasn’t sold a lot of K900s. Slightly over 5,000 of them have found homes since it launched at the time of this writing, which for perspective is about a quarter of the amount of Accords Honda usually sells in one month. But that’s not what we’re here to talk about. We’re here to talk about the realities of the K900, because it’s a car that has been comically short-changed by the press and pundits since it first arrived. Why do I say this? Well, I recently had the chance to drive one, and WOW. This is a proper automobile, the type of car that in ten years we’ll look back and wonder where it went. Handsome but not over-the-top lines are a good start. It has the well-proportioned bones of the original Genesis under the skin, wheels pushed out to the corners with a sense of balance. It has actual windows, not gun slits. It’s large but not cumbersome looking, not ashamed to be a big car. The optional LED reflector headlights give a nod to the 3rd-gen Q45 with their machine-gun appearance. It’s easily mistaken for, say, an Optima or a Cadenza. It doesn’t speak loud. But it certainly does carry a big stick. The powertrain is the main attraction, and a quick spin around the block is proof enough that in five years we’ll be crying over the flood of forced-aspiration six cylinders that we WILLINGLY replaced our V8s with. “Oh, they have better low-end torque. Oh, they do better in EPA testing. Oh, their carbon footprint is smaller.” That’s great; go wind a 5.0L Tau V8 out to 7,000rpm as you pull into traffic and get back to me. This is a classically wonderful motor, a whisper-quiet idle you can’t feel through the wheel, seats or dash. It has a smooth, delicate tip-in that’s great for shmoozing around town; it’s relaxed power that requires gentle application of the big toe in day to day traffic. Pin the taps open and the K900 bursts forward like it’s been rear ended, bellowing a symphony of sophisticated quad-cam V8 noise. It’s a fast car by my standards: 0-60 in 5.4 seconds and a 13.9 second quarter at 103mph is quick. That puts it on approximately level ground with another big, fast sedan: the Taurus SHO. There’s no comparison driving them back to back, the EcoBoost serving up a fat slice of torque off idle and then doing its best impersonation of a Dyson with a clogged filter playing a trumpet as you’re somehow bored with prodigious acceleration. How’s the rest of the car? Great! It’s got a remarkable stereo, the leather in the interior is extraordinarily soft and well trimmed, it heats and cools your behind, and it’s generally a pleasant place to spend time. The transmission is also a sigh of relief: torque converter automatic, 8 speeds, that does what you tell it when you tell it without bouncing your head off the headrest during fast shifts. It’s predictive and responsive in just the right ways. The brakes are also massive: fixed calipers with four pistons and huge ventilated rotors in the front haul this big boy down without any drama. As a highway companion, it’s beyond reproach, settling into an inaudibly low engine speed in 8th gear and soaking up expansion joints in stride. But the point is, there’s something irreplaceable about a big, naturally aspirated, high-revving V8. There’s also something cool about the K900: it’s not pretending to be something it isn’t. It seems that these days, luxury cars come in two varieties: sharply styled, harsh riding, performance-oriented (like an A6) or slow, relaxing, and shaped after a bar of soap (like an ES300h). The Kia K900? It’s a modern Q45: a handsome, if anonymous, sedan from the East, that seems unremarkable until you plant your foot in the carpet and overtake seventeen cars at once. It’s not harsh riding for the sake of stealing BMW customers. It wasn’t styled with an axe to impress Cadillac buyers. The K900 is a well made large sedan, with a singing angel choir of a V8, that gets you where you’re going quickly and comfortably. If I had the cash, I’d get one before they’re gone.